Sometimes, an equity is so beloved that there’s no one left to buy it. I’m looking at you, late-2012 AAPL. I’m also looking at YOU, priceline.com, with your 97.8% institutional ownership. This chart will keep updating itself so I can come back in a few months and see how wrong I was. 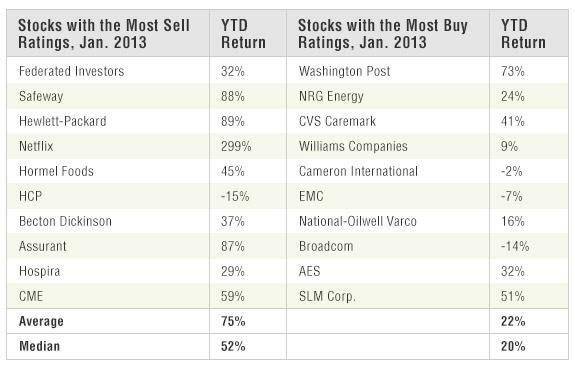 In 2012, the best-performing sector was Financials. In prior years, everyone hated real estate and bank stocks so much that they couldn’t possibly hate it any more. In 2013, the best-performing industries were Semiconductor Memory and Solar. We’ve been bearish on solid-state anything since Solyndra died in 2011. When all the experts and forecasts agree, something else is going to happen. If you bought the 10 stocks in the S&P 500 with the most sell ratings at the beginning of the year, equally weighted, you would have been up 75% YTD. If you bought the 10 stocks in the S&P 500 with the most analyst buy ratings, you would have only been up 22%. The worst-performing industries this past year have been Industrial Metals & Minerals, Latin American Banks, and Residential REITs. If you’re a contrarian, go nuts and buy gold and investment-grade bonds, because the crisis isn’t over AHHHHHH. Scale back on U.S., European, and Japanese stocks. Increase exposure to emerging markets, especially Brazil. A contrarian is, by definition, fighting the market. You cannot do this all the time unless you enjoy being wildly wrong. Disclosure: I am long ARLP and BTU. Reblogged this on Investing Happily.